I got pregnant on my wedding night. Let me back up a bit, on the details of this story. I got married when I was 33. I was not in a big hurry to settle down, as I was enjoying traveling and learning about the wonderful world of energy and metaphysics. Obviously, that changed when I met my husband. My mother really wanted to be a grandmother, so she, being the wise woman that she is, decided to take things in her own hands. She used to be a clothing designer, so when she asked me if I wanted her to make my wedding dress I said, “of course.” When making my wedding dress she hand-sewed hundreds of moonstones and crystals on my dress. She told me that it made the wedding dress sparkle. The man who designed my wedding band added all the finishing touches under the light of a full moon. He told my husband when he picked up the ring that we needed to take extra precaution if we did not wish to become pregnant, because my wedding ring, which has eleven healing gemstones from around the world in it, was extremely fertile. Between my mom, the ring designer and the energy of the crystals, my destiny was set. And I gave birth to my son nine months later. I am a huge believer in using crystals for fertility. 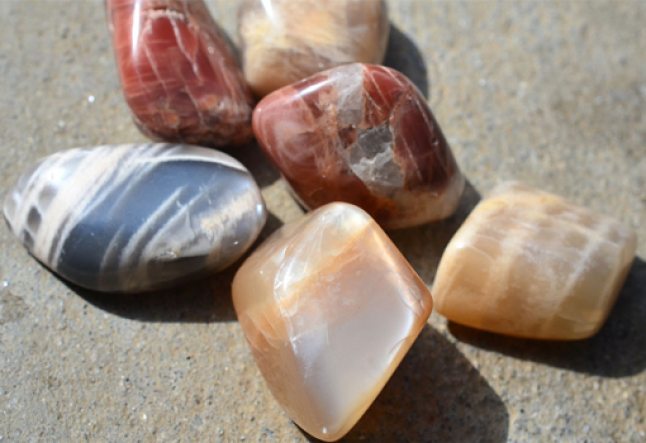 I personally utilized the energetic power of moonstone when getting pregnant with both of my children. I knew how, historically, when moonstone was placed under a full moon to be charged with the energy of the divine feminine, it could significantly help with fertility. I thought to myself, if using the power of moonstone worked for the people of ancient civilizations, there must be some girth and truth to this method. My business partner, Timmi Jandro, also harnessed the healing power of crystals when she wanted to become pregnant. She would wear moonstone jewelry and have moonstones tucked away in her bra everyday, becoming pregnant shortly after starting this ritual. I asked one of my doula and healer friends, Lori Bregman, who owns Rooted for Life if she believed in using crystals for fertility. She said, “absolutely!” She believes that bringing a variety of healing modalities, such as crystals, intention, yoga, meditation, visualization and proper nutrition, brings mindfulness into a pregnancy. When a pregnant woman feels calm, supported, safe and nurtured, the baby inside her will also feel the same way. A variety of crystals for fertility exist, such as Moonstone, Morganite, Pink Tourmaline and Angelite, just to name a few. Healing crystals are very grounding, because they come from and carry the energy of the Earth. They feel good when placed on your body*—plus they are pretty, and beautiful to wear. When we are grounded and connected to the Earth, we make better choices and take better care of ourselves. If you believe that crystals can help you to make better choices with nutrition, help you to stay calm and relaxed or help you in staying focused on what your body needs to be healthy, then crystals can be very powerful tools to utilize on your journey to becoming pregnant. At the end of the day, the journey of becoming a mother is one that changes you forever—for the better. On this journey, you learn faith, patience, compassion and how to listen to yourself. This is also what the energy of the crystals teaches us—how to breathe, how to slow down and how to listen. This formula is a very powerful one to follow in order to be successful.